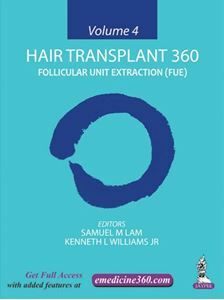 Hair Transplant 360, Volume 4 represents the first, comprehensive book on the subject of Follicular Unit Extraction (FUE). FUE is the fastest-growing segment in the hair-restoration industry but has never been thoroughly reviewed in a major textbook. This edition is focused on providing practical tools and techniques for the practicing physician and the surgical-assistant team interested in FUE from novice to advanced status. Volume 4 is the final imprint in the only book series ever produced on the subject of hair transplantation including Volume 1 (a single-author perspective on the basics of hair loss and hair transplantation), Volume 2 (the only textbook of its kind dedicated to the surgical assistant), and the recent Volume 3 (the largest hair-transplant textbook ever written with 80 chapters covering contemporary hair-transplant techniques, hair-repair methods, business development, difficult cases, and many chapters for the surgical assistant). Chapters 4, 6, 8, 10, 11, 14 to 18 and 21 to 25 contain video(s).